If you like making jewelry, consider yourself a bead "collector" or even appreciate a handmade jewelry piece, then you will love Callie from The Bead Farm. This local shop happens to be one of my favorite go-to Girls Night Out locations. No need to invest in the tools and beads just to have them sit in a box at home, learn why making a date with a favorite local shop is a lot less expensive and more fun. Be sure to like The Bead Farm on Facebook and check below for other posts about the fun projects I have created over the years with Callie's help. Here's some blog posts I've done about The Bead Farm...like I said I'm a huge fan!! NO Pins Referenced in Today's Episode, but here's some images about The Bead Farm I wanted to share. Do you have empty plastic water bottles building up around your house like I do at my house? 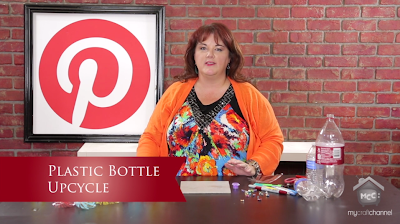 Then you'll love some of the creative ideas that I share in today's Inspired by Pinterest "Plastic Bottle Upcycle" episode on My Craft Channel. I will share a creative way to create painted flower lights and make glass-like beads from cutting up those water bottles. 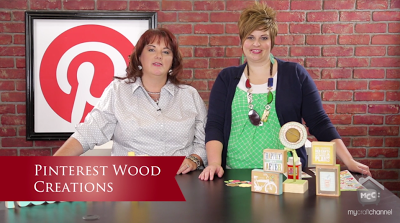 Join me today as I show you more ways to work with "leather". But in the episode she combines the cool leather stamping techniques you love with her embossing folders and embossing machine to get some very unique textures on the leather. Happy IndependenceDay!Hopefully you have a minute to check out today's episode, but if not...it will still be here tomorrow!